Do you have a large attached garage with vaulted ceilings and lots of wide open space between the garage roof rafters and ceiling joists? If so, you may have a “diamond in the rough” if you are in need of more living space for your home. One of the most cost affordable and best ways to add more living space to your home is to build a room addition over your existing attached garage. Room additions over garages include such finished spaces as bonus rooms, home offices, in-law apartments, and billiard rooms. Room addition over garage costs are also typically lower due to the fact that the garage already has an attic space above it, and the attic space is simply being finished into a living area. In addition, unlike attached home additions, there is no excavation and foundation work required. 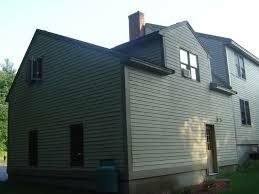 Thus addition over garage costs are often much lower than alternatively building an attached addition. Here’s an room addition above a garage, with a large dormer on the back of it. If you have a garage that has the possibility of supporting a second story room addition, there are a few key items that you first need to consider before jumping into such a project. If you were to complete a second story room addition above the garage you first need to figure out how you are going to ingress/egress it. For example, is there an existing stair well that already leads to the garage loft area, or does it already have an entranceway via the main home? If there are no current Ingress/Egresses into the garage loft area, then you will need to figure out how to enter into the space. For the best return on investment, ingress/egress should be via the main home, and not via a stair well into the downstairs garage area. Garage ceiling joists are frequently not sized to code for finished living space above them. Thus they cannot support the weight of a finished room addition. Consequently it may be necessary to sister (or marry) larger ceiling joists to the existing garage ceiling joists. You will need to check with your local building inspector to determine if Sistering will be required. Due to the fact that you are planning to create a room addition in an otherwise large attic area, chances are you will have height / head room issues. Use this room addition over garage checklist to save money, time and hassles on your room addition project. Items that will need to be considered are installing knee walls and collar ties to “square up” the room. Knee walls will shrink the living space of the room addition, however if done smartly, built-in cabinets and closets can be melded into these knee wall areas. Regarding collar ties, collar ties will allow you to create a flat ceiling in at least a portion of the room addition, and will provide more structural support to the roof rafters. Where you position the collar ties, will dictate the maximum height of the room. If you are planning an in-law apartment, bathroom, and/or kitchen area in the room addition above the garage, you will need to consider where existing drains and vent stacks exist within the home. Adding plumbing to a room addition over a garage can be a tricky endeavor so make sure you meet with your plumber during the planning phase of your project. 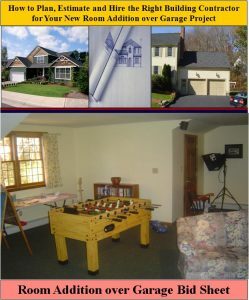 For more help on Building a Room Addition above a Garage, see HomeAdditionPlus.com’s Room Addition over Garage Bid Sheet. This tool, along with an accompanying cost breakdown spreadsheet, will enable you to find the right contractor and manage the costs on your room addition project. The Room Addition over Garage Bid Sheet includes an extensive questionnaire (Request for Quote) that a homeowner can provide to prospective general contractors and subcontractors for bidding the room addition. In addition, the bid sheet also includes estimated costs and time intervals for constructing a room addition over a garage as well as a list of key home material manufacturers. Finally, the bid sheet includes an extensive set of helpful tips and advice on making sure the room addition is built properly and on time and budget.